Located within Ocean Edge. Our Eaton Village home offers single floor living with golf course views. Tastefully decorated; queen-size bed in master, 2 twins in second bedroom, 3 piece leather living room set and designer-grade dining room set. This condo is on the ground level, first floor and sleeps 4 comfortably with 2 full bathrooms, one is a private master bath. The kitchen is fully remodeled including ceramic tile, all new appliances, new cabinetry, custom countertops, and a new stacked washer/dryer. Additional amenities include; A/C, cable TV, Wi-Fi, DVD/VHS player, outdoor patio & grill. Ocean Edge Resort provides everything a Cape Cod vacationer could desire: three on-site restaurants, a 6,665-yard championship golf course, golf driving range, immediate access to the Cape Cod walking/biking path that extends 26 miles. Or enjoy kayaking or stand up paddle boards at one of the kettle ponds Ocean Edge offers. Only a five-minute drive to Brewster's bay-side beaches, Cape Cod Baseball, great fishing and lots of restaurants. Patio out back overlooks the Ocean Edge Golf Course. One large air conditioner located in the family room / living area. Wifi available as part of the rental. Plenty of room to seat 6 - 8. Kayaks and SUPs can be rented directly on Ocean Edge propriety. Can be rented directly on Ocean Edge propriety. We are located on the first floor, but there is one step entering the condo. 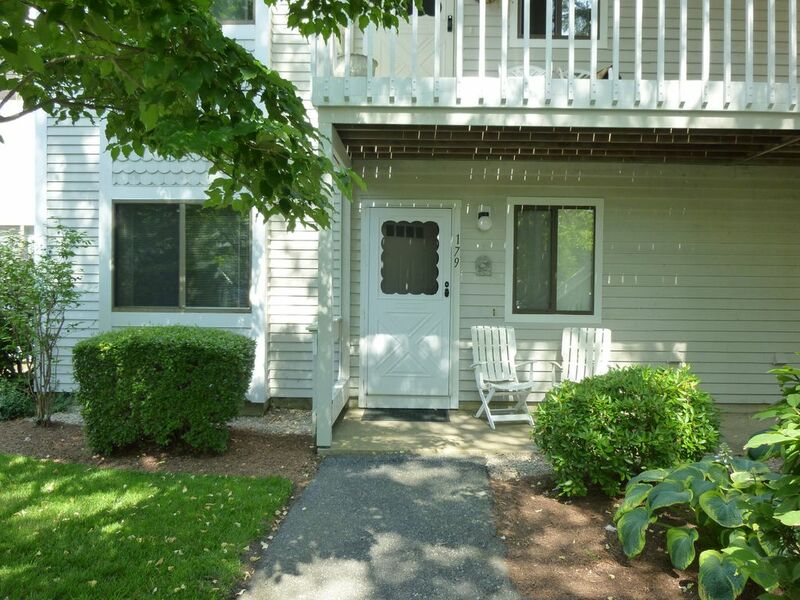 Very comfortable condo and location is so convenient to beaches on the Cape. Lovely complex to walk, ride bikes, etc in addition to the golf. Would return or recommend this rental. Each bedroom is decorated with new comforters and pillows. Through out you will notice a nautical theme with many local pictures and paintings of the Cape and surrounding area. The main living is spacious and flexible with access to a walkout patio. Let in the Cape breezes or relax on the patio with views of the golf course. We pride ourselves on the cleanliness of our home and it is furnished with all of the essentials you would expect at your own home. We have 2 televisions and a DVD/VHS player so that families with different viewing (or video gaming) preferences can live in peace. We are 2 miles to the Brewster beaches and convenient to all points in Chatham, Orleans, Harwich and Dennis. If you are new to the Cape or the Brewster area we are willing to assist you with advice on attractions and activities. Multi week discounts. Please inquire directly for long term rentals. All rates include cleaning fees and taxes. Added HomeAway service charge is book directly thru the site.